I hope all my US readers had a great time celebrating Independence Day and my European readers aren’t fretting too much over the possibility of Greece leaving the Euro zone. I had planned a really low-key post today — a post for Back to Marketing Basics to ease us all back into the work week, but I found this really nice infographic, so I thought I’d share it with you today instead. I’m constantly amazed when my potential clients and even marketing colleagues fail to understand the importance of content marketing for SEO, brand reputation, awareness, and lead generation or sales. Even digital marketers find it difficult to keep up with changing standards related to the diversity of content marketing options. 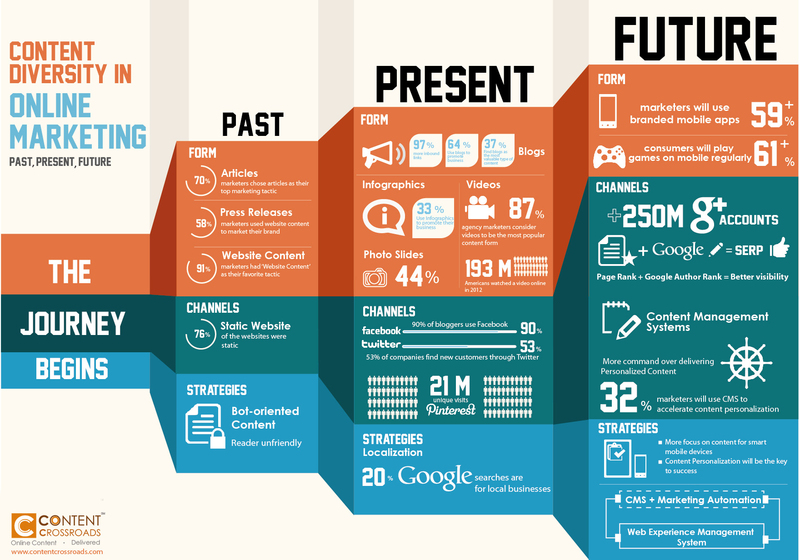 To help, I found this infographic on how content marketing, and digital media in general, has changed over the last few years and what’s likely to work in the future based on these trends. (I realize some of these graphics are small. You can either select the image and zoom in, or just read on for the highlights from this infographic). We all know, or should know, what content marketing looked like in the past — low-value, mostly static, poor visuals, focused on link-building and keyword stuffing, and almost unreadable. I remember when I first started blogging, my mentor complained I was using my keywords too infrequently and posting content that was too long. Luckily, I went right on crafting high-value, long posts that provided helpful insights for digital marketers. Just a few years later, Google introduced Panda, Penguin, and Hummingbird in quick succession. Each algorithm update placed a higher penalty on the kind of content my mentor recommended. I’d love to say I anticipated Google’s crackdown on poor quality content, but it isn’t so. I simply did the right things and Google decided to reward them. Now, I have one of the top digital marketing sites and my content is syndicated on Business2Community, Yahoo Business, and Social Media Today. I guess the lesson here is to focus on your customer, give them what they need, and the rest will take care of itself. Of course, content marketing in the present is optimized for the most recent Google Search Algorithm, which is actually updated on a weekly basis or even more frequently. The most recent algorithm update introduced a penalty for websites that aren’t mobile-friendly — termed Mobilegeddon. You can read more about Mobilegeddon and how to survive it here. Keeping up with algorithm changes is challenging. Here’s a Google page giving you some background on search — how it works, components of the search algorithm, etc. Also, subscribe to the Google Webmaster Blog to keep up-to-date on changes to the algorithm. 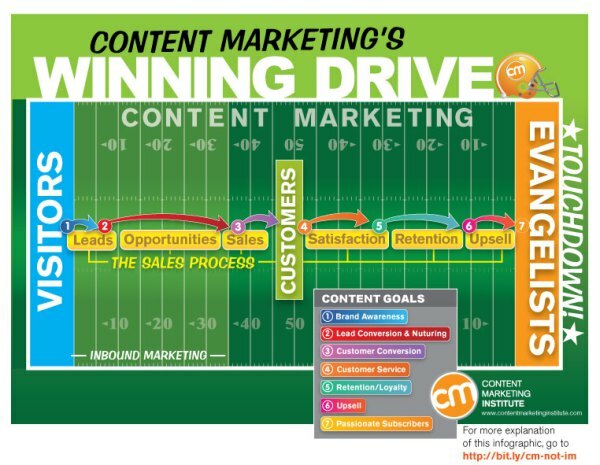 But, content marketing is more than just SEO (search engine optimization). SEO creates awareness and enhances your reputation, but you need more to move consumers down the sales funnel. So, the present of content marketing focuses on providing more than just SEO, introducing or expanding on other forms of content, such as video, images, and infographics. Also increasing in importance are, webinars and podcasts as content marketing embraces a variety of content formats to engage readers/ listeners/ viewers. My posts now contain an average of 3 images where, in the past, there was normally 1 image to the right of the first paragraph. Plus, images tend to be full frame images, rather than little images to the left or right of your written content. Creating and finding quality, unique images is now as time-consuming as writing the content — if not more time-consuming. Not only are images more important in your content marketing strategy across your website and social networks, Instagram, Flickr and Pinterest (image-heavy social networks) now command attention as a source of customers. The same goes for video, where quality varies from movie quality to rank amateur quality. But, it’s all good for building traffic and conversion. A plethora of tools help manage the process of creating quality images, video, infographics, and podcasts. I’ll create a list on List.ly with my favorite ones and share that with your soon. Think beyond traditional digital marketing channels for sharing your content — go beyond Facebook and Twitter. For instance, nearly 47 million people visited Pinterest in April, 2015 — mostly women. Want more fun facts about the present of content marketing? 20% of Google searches are for local businesses — which means businesses need to optimize their content for local. I feel a little like A Christmas Story, but our journey wouldn’t be complete without a look at the future of content marketing. Based on the infographics, about 59% of marketers will use branded mobile apps in the future. The question is whether folks will USE all these branded mobile apps. The average smartphone user currently has 30 apps loaded on their device, but only use a handful of these on a regular basis. Competition to get your app on their device is intense and app stores overflow with apps that are only downloaded on a handful of devices. You’ll need a 1st quality app if you want to break through all that clutter to get your app downloaded, then be very sticky if you want users to open your app frequently. Honestly, most apps don’t meet this standard and they’ll really need to up their game if they want to survive in this mobile future. Games on mobile devices are also big … and getting bigger. Words with Friends, Farmville, and Angry Birds are played by millions. A local company introduced Exploding Kittens on Kickstarted; raising over $8 million and blowing their original goal out of the water. While not a mobile app, it likely will be and shows the power of games to drive use. In terms of channels, Google+ is the most overlooked social network. 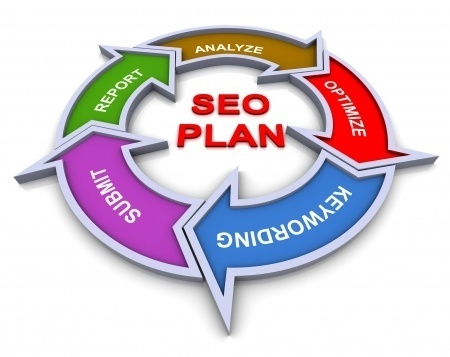 While the platform failed to generate the engagement achieved on Facebook and Twitter, businesses still need to be there because Google+ posts get great pagerank and help the pagerank of the entire site because those little +1’s given by your network translate into better SERPs through the Google Algorithm. If you’re not on Google+, stop being a snob and set up a profile. Important for the future of content marketing, is combining CMS (content management systems like WordPress, Drupal) with automation. That’s because I see too many abuses of automation. It’s important to know which tasks SHOULD be automated, which CAN be, and which tasks you should manage manually. follows — it’s ok to auto-follow someone who follows you. I don’t advise it, but you won’t suffer too much. content creation. I know there are tools out there for creating content. I think that’s a huge mistake. Don’t just share content using tools like Hootsuite. Customize each post for the platform and your community. commenting. Whether it’s sending a direct message to thank someone on Twitter or answering a concern on Facebook. Take the time to respond personally. customer support. We’ve all had the experience of being offloaded to the FAQ’s rather than having someone to answer our questions. Mistake. engagement. Take the time to be actively involved with your community and share their content, as well. This article was syndicated from Business 2 Community: Do You Need A Rainbow In Content Marketing?